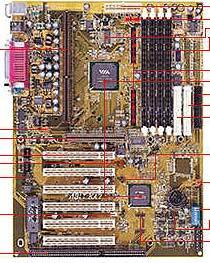 When the AMD Athlon processor was first released, back in the days of the AMD Irongate 751 chipset, a lot of people waited for ABIT to release a motherboard for the Slot-A platform. Unfortunately, lack of cooperation between AMD and ABIT for one reason or another, prevented that from ever becoming a reality. The KA7 sports ABIT's Soft Menu III, which enables the manipulation of the CPU FSB up to 155 MHz, as well as the manipulation of the CPU core and I/O voltage via the BIOS. The board also features DIP switches for the above mentioned adjustments, and believe me they do come in handy when you are trying to over clock your CPU to the moon and it refuses to come up. Three of the coolest features of the Soft Menu III are the ability to adjust the memory speed asynchronously of the front-side bus speed, the ability to ensure your PCI speed remains close to the default 33 MHz, and starting with the "RY" version of the KA7 BIOS, the ability to adjust the Athlon L2 cache speed. Let's look at these three features more closely. First, the ability to adjust the memory asynchronously of the FSB speed comes with the obvious benefits. Using this feature the KA7 gives the ability to run our RAM at +33 MHz or -33 MHz from the FSB speed. For example, if you have PC-100 SRAM, you can still run your processor at 133 MHz FSB and your RAM can still remain at 100 MHz. For this review we used an Athlon 600 over clocked to 733 MHz utilizing 133 MHz bus. In this situation we were still able to use PC-100 SDRAM with no problems. It would be best to utilize PC-133 SDRAM for better overall performance, but sometimes that is just not possible. This feature can also work the other way around. For example, you could be running your CPU at 100 MHz FSB and your memory at 133 MHz. This situation would be ideal because you would be getting the full benefits of 133 MHz RAM transfer speeds even if your processor's core couldn't handle the speed that would come from a 133 MHz FSB. Its a beautiful thing. Second, the ability to adjust the Athlon's L2 cache speed would sometimes help immensely in your quest for more speed. As many of you may already know, starting with the Athlon 750 MHz, AMD was forced to run the L2 cache at speeds other than ½ of the core speed. This was primarily brought on by the fact that AMD wasn't able to acquire high quality SRAM chips for cheap. So, we started seeing Athlon CPUs with L2 cache speeds of 2/5 of the core speed vs. the normal ½ of the core speed. In our case, we had an Athlon 600 MHz. The L2 cache speed for our 600 was set to run at ½ of the core speed which works out to be 300 MHz. We know that if AMD was forced to run the L2 cache speed of a 750 at a ratio of 2/5 then we may run into problems with the L2 cache at speeds over 300 MHz. So, over clocking a 600 MHz Athlon to 700 MHz without adjusting the L2 cache, we are looking intro trying to run the L2 cache at 350 MHz. That is most likely going to be problematic. Using the KA7's ability to adjust the L2 cache speed we can alleviate this problem. Last but not least, is the ability to have the PCI bus speed remain as close to the default 33 MHz as possible. This is accomplished in the KA7, by allowing you to increase the FSB speed completely independent of your PCI bus speed. In the Soft Menu III, you are able to set the FSB/PCI to 100/33 ratio, but you are also able to increase the FSB up to a maximum of 28 MHz above while still retaining the 100/33 ratio. So if you wanted to reach a 133 MHz FSB, all you have to do is adjust for a 105/35 FSB to PCI ratio, and then increase the FSB by 28 MHz for an effective 133 MHz FSB.